I'm in the progress of finishing up a bunch of very belated book reviews, but this is the one I'm going to start with, because it's the best book I've read in 2015 so far. I received an ARC copy of Etta and Otto and Russell and James back in September 2014 and made it to page 3 before putting it aside until April 2015 (I KNOW). Frankly, this book is slow, but it is slow in a measured way. It feels like you're taking a deep breath and holding it. And of course, there’s Etta and James, the coyote who Etta encounters along her journey. My favorite chapters in the book involve Etta and James. Yes, it’s magical realism, and sure, maybe it does feel a little bit out of place relative to the rest of the story, but it adds a certain richness, a sparkle, to Etta’s journey. It makes it easier to step aside, away from the doubts and criticisms (“An eighty-two-year-old woman trekking across Canada?”), and towards acceptance of her purpose and what she wants to accomplish. And that’s a big part of this book, too: finding yourself, finding what drives you when the status quo is gone. Otto has an incredible path of self-discovery in particular. From collecting all the newspapers that mention Etta, to turning all of that paper into art – it blows my mind to think about how Emma Hooper tied it all together. Perhaps my biggest qualm with E&O&R&J is that Russell’s presence seems the least important relative to the others. His story plays a significant role in the flashbacks that somehow still merge seamlessly with the present, but at times, he feels like little more than a plot device made to create tension between Etta and Otto. I would have liked a closer look at him and at what makes him tick, since Emma Hooper has done that so well for the other characters in this story. This book is about journeys – journeys across land, journeys through life, journeys to find, remember, and reveal oneself. Some of these journeys are stark and upsetting; some are vague and dreamy and surreal. 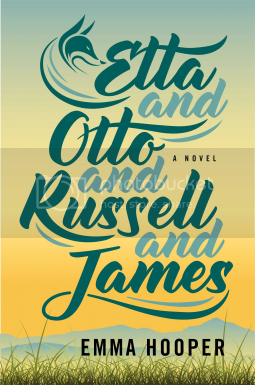 Etta and Otto and Russell and James is filled with fascinating characters and an ambiguous ending, and it ends in a good place – it ends in the only place that could ever make sense – but still I can't help but wish there were more.